Building on the success of our inaugural Planning 101 workshop, where more than 50 people learned about urban planning and land-use processes in Los Angeles, Council District 13 will be hosting Planning 102, entitled "Parking Regulations and Policy." The session will provide information on the city's parking requirements for different land uses and an update on the proposed parking code amendments, and will be topped off by presentations on parking by experts Mott Smith and UCLA professor Donald Shoup. The workshop will be on Saturday, June 16, from 9:30AM-1PM at the Will and Ariel Durant Branch Library, located at 7140 Sunset Blvd. Refreshments will be provided - please RSVP by email or over the phone at (213) 473-7013 by June 13th. Next week, Councilmember Tom LaBonge will be holding a Special Arts, Parks, Health & Aging committee meeting at Griffith Park to discuss the restoration efforts that are underway. There are a number of converging issues that our city, state, and federal departments will be examining as we work to restore the park, including safety concerns, the ecological impact of the fire, and the cultural and recreational components of Griffith Park. Griffith Park is one of the few places in the world that is home to the chaparral ecosystem, characterized by our particular climate and vegetation. I've asked Richard Halsey, director of the California Chaparral Institute, to provide some background on the chaparral and the impact that the fire will have on the ecosystem. For more information on next week’s committee meeting, please visit the LA City Council Calendar. Chaparral is California's most extensive and characteristic ecosystem. It is a specialized plant community shaped by a Mediterranean-type climate (hot, dry summers and mild, wet winters) dominated by drought-hardy shrubs such as manzanita and chamise (California's most common shrub west of the Sierra Nevada) and is the predominant plant community in all four National Forests in Southern California (and the Santa Monica Mountains). What areas of the world are home to the chaparral? The term chaparral specifically refers to the shrubland community in California (with extensions in southern Oregon and Baja California). However, Mediterranean-type climate shrublands exist in South Africa, Central Chile, around the Mediterranean, and southwestern Australia. Each of them has its own special name. What impact will the Griffith Park fire have on wildlife, vegetation, and the ecological balance of the area? Fire is a natural part of the chaparral ecosystem. That said, the ecosystem is not adapted to fire per se, but rather a particular fire pattern. Too many fires over a short period of time will completely eliminate the system, with non-native weeds typically taking its place. We know for sure fire intervals less than 10-15 years will eventually eliminate the system. Before humans entered the picture, lower elevation chaparral systems like those found in Griffith Park probably had fire return intervals on the order of several centuries. Since there has been a long enough time since the last fire in most of the area burned, the system will naturally recover. There will be a fascinating succession occurring over the next 10 years as the system slowly recovers. Bird populations will change as well as new vegetation appears and shrubs begin to re-create the closed canopy. Scientists expect wildfires to increase in the coming years - can you explain the climate and ecological reasons for this, and what the impact of more frequent fires will be for our ecosystem? Fire frequency over the past century has increased in lock step with population growth. However, as areas become urbanized, there is less wildland to burn, so there has been a slight decrease in the number of fires in certain Southern California regions over the past 25 years or so. Although global climate change may cause drier conditions in Southern California, we are unsure how it will impact the one factor that determines both the size and catastrophic nature of wildfires here, Santa Ana winds. As I mentioned previously, increased fire frequency can gradually eliminate chaparral systems. In fact, increased fire frequencies can compromise nearly all native plant communities. Which brings up an important point; you hear about how fire suppression has caused an "unnatural" build up of fuels. Yes, maybe for dry ponderosa pine forests and some local mountain forests, but not for the chaparral in Southern California. Our problem is too many fires. What concrete steps can be taken to restore Griffith Park? The best course of action is to let nature take its course. In those areas where there is a possible threat of mudslides, mitigation can take place such as laying down straw, building check dams, etc. This event may actually create a wonderful opportunity for the community to reconnect with nature as citizens visit the park and notice the gradual re-growth. If we have adequate rainfall this fall, you'll see an abundance of wildflowers and beauty LA hasn't seen in the park for generations. 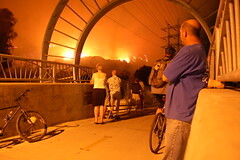 Everyone's attention has been captured by the fire, so it presents some perfect teachable moments. The Los Angeles City Planning Commission has unveiled a 14-point policy agenda (.pdf link) to set the city on a course towards sustainability, using Planning Director Gail Goldberg’s mantra of “DO REAL PLANNING” as an acronym for the platform. This entry concludes my point-by-point evaluation of each of these planning principles through the lens of my own district work and the potential for citywide direction along these lines. Predictability in the process is essential. By sharing the new “rules of the road” as we develop them together with the Planning Commission and the mayor, I'm trying to do my small part. I've also pushed for our updates to the community plan, such as that underway in Hollywood, to give predictable, transparent, and straightforward planning guidelines that help our planning bureaucracy communicate clearly with developers and stakeholders. The closer that new development proposals adhere to the thirteen previous principles above, the smoother the process will be. And the stronger our interconnected and urban 21st-century city will become. Read all 14 DO REAL PLANNING posts here. 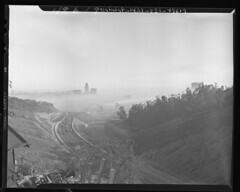 A friend browsing the UCLA library's digital collection finds this 1948 view of City Hall in smog, taken from the Arroyo Seco. Original here. My colleagues and I unanimously adopted an ordinance to close a loophole that threatened the city's supply of rent-stabilized apartments. Under a California law known as the Ellis Act, landlords may exit the business of renting residential property by converting their property to commercial or for-sale residential, with some restrictions. This has resulted in a loophole allowing property owners to demolish their rent-stabilized apartment buildings and build new apartment buildings with no rent restrictions. The law we passed, without placing undue burden on property owners, will stop people from bending the rules to evict low-income tenants and will encourage the production of new affordable housing. Under the new law, if a landlord evicts the tenants of an apartment building with the intent of leaving the rental property business, demolishes the building, and builds a new rental building, there are two options. First, the owner may raise the initial rents to market levels. Further rent increases in the new building are then regulated under the terms of the Rent Stabilization Ordinance. If the owner prefers, he or she may designate up to 20% of the building's units affordable to tenants earning 80% or less of the area median income. A building with 20% affordable units may then take advantage of the available building-envelope incentives regarding parking, setbacks, and height. Today's unanimous vote signalled a meaningful policy victory. It's one piece of the puzzle. We need to do a lot more in order to create housing at all levels and seriously address the housing crisis. Stay tuned. The walkability of urban streets is directly related to the linear foot allocation between roadway and sidewalk. My office consistently supports the pedestrian realm, not only by planning ahead (see our walkabouts referenced in "Demand a Walkable City") but also by emphasizing pedestrian-based design and scale in our neighborhoods. In Atwater Village, the Pedestrian-Oriented District is an unqualified success along Glendale Boulevard. One of my first campaign promises was to build a branch library in Silver Lake. Thanks to the fact that Proposition DD, the 1998 Library Bond passed by the voters came in under budget, I successfully lobbied the Library Department to take the savings and build a library in Silver Lake. After securing additional funding, finding a site, and working to make it a "green" library (it will be one of the most environmentally sensitive buildings built in Los Angeles) that evoked some of the great Modernist architecture in Silver Lake, we moved forward. 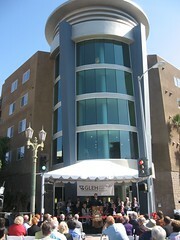 Curbed L.A. covers the latest news on the library. This year's annual Cuban Festival in Echo Park was a great success on Sunday. Jamaican Salsero was there and captured some pictures and a video of the Salsa Kids. Atwater Village Newbie covers a moment in time when the Red Car made its last journey to Atwater Village. On Thursday night, in East Hollywood/Mid-City, I attended the Second Annual Bresee Youth Film Festival, which highlighted more than forty young filmmakers from local high schools who tackled this year's theme, High School Dropouts. I was one of the judges and the films were a collection of raw, gripping, moving works that put a new light on an issue getting new attention throughout our city. On the wheels of Bike-to-Work-Week Will Campbell has a good piece in the Los Angeles Times on integrating bikes into the Los Angeles streetscape through mainstreeting, not bike lanes. The latest Griffith Park news from the City. And lastly, for a great visit of the Los Angeles of yesteryear, check out LA Time Machines. The Los Angeles City Planning Commission has unveiled a 14-point policy agenda to set the city on a course towards sustainability, using Planning Director Gail Goldberg's mantra of "DO REAL PLANNING" as an acronym for the platform. In many ways, CD13 has already begun to do land use work with these principles in mind, in ways that I hope can help set a citywide standard. A small revolution is underway--and where better than in Los Angeles, where parking has aspired to art? My office has convened businesses, city departments, neighborhood councils, and others to develop a parking management district in Hollywood to better manage the inventory of public and private spaces that exist. Combined with a district-wide valet, neighborhood circulators like the Holly Trolley and shared use spaces that are close to transit, we are showing how we can accommodate cars while expanding more transportation options for getting to and around the neighborhood. On a unanimous vote (following many weeks of hard work by the Budget and Finance Committee and countless revisions and amendments), the 2007-2008 Fiscal Year budget passed the City Council. 1) To strengthen the city's fiscal health even further (our fiscal strength is already the strongest of any big city in America, according to Wall Street). 2) To boost basic city services like sidewalk repair, tree trimming, and street paving in the budget, the heart of our work as City Councilmembers. 3) To fund core priorities of the City Council including but not limited to public safety programs to boost our police strength and provide job and educational development alternatives for our youth; increased funding to end homelessness in Los Angeles; funding our work to revitalize the Los Angeles River; and funding traffic and transportation improvements throughout our city. For copies of the documents leading up to today's vote (including the mayor's proposed budget and the committee report), visit the Los Angeles City Council Budget and Finance Budget-Related Documents Page. Budget and Finance Chairman Bernard Parks, as well as Vice-Chair Wendy Greuel and members Greig Smith, Bill Rosendahl, and Jose Huizar helped prepare an excellent budget that built on the strength of the mayor's proposed budget. The council was able to boost infrastructure spending by more than 40 percent, add $1 million in funding to acquire more books in Los Angeles libraries, fund a program to crack down on illegal signs, and boosted our reserve fund for a rainy day to an historic high of more than $200 million, all in a very tough fiscal environment. We also empowered Los Angeles residents to be closer to their government by funding three positions to work with neighborhood councils, a new system to help the public track council motions, and funding to complete updates for eight community plans for our neighborhoods. Finally, we approved funds to help restore Griffith Park following this month's fires and to continue our Heli-Tanker lease to help fight brushfires throughout the city. $6.79 billion moves forward to the mayor for his signature. All in a good day's work at City Hall. Don't forget, if you would like to see any of the proceedings of the budget deliberations, you can watch them from the video on-demand feature now available at the council on-demand home page. My indispensable friends over at Curbed LA (better than a cup of coffee in the morning for all you land-use types) interpreted this principle as a veiled entreaty to get City Council staff out of the way of planning decisions. I didn’t read it in exactly the same way. Stakeholders in a democracy demand and depend on their voices being heard in the planning process. And this does not just mean NIMBY voices: council offices, neighborhood councils and non-profit groups are critical to positive, proactive and community-based planning. In an era of term limits, though, the predictability of meaningful community plans becomes evident. I strongly support the Planning Director’s efforts to reclaim the role of predominant manager of the General Plan. This will rely on the strength of the General Plan revision itself, which must be done in community-focused and neighborhood-specific fashion. Right now, planning and zoning is often highly unpredictable—to the community, to builders, and to urban planners alike. It's based on a speculative land market which in turn rests on the discretionary actions of the system, rather than on adherence to well-thought-out community plans. Of course, adherence to the plan requires the plan to get regular, thorough updates. I'm committed to helping the department get the resources to do these in a timely fashion and to have staff it needs to help these plans get implemented. I've shared the frustration of many members of the Hollywood community who have waited years for the update to the Hollywood Community Plan, for instance. This effort is now on track. We hope it can be a showcase for a Planning Department that serves the primary implementer of a community-driven plan. The Los Angeles City Planning Commission has unveiled a 14-point policy agenda to set the city on a course towards sustainability, using Planning Director Gail Goldberg's mantra of "DO REAL PLANNING" as an acronym for the platform. I am blogging each of these planning principles through the lens of my own district work, and I hope that the real-life examples from CD13 can help set citywide direction along these lines. Many neighborhoods throughout Los Angeles struggle to protect and preserve their unique character. I have supported the creation and expansion of Historic Preservation Overlay Zones in Echo Park. I also support the Planning Department's efforts to create a citywide building-envelope regulation to address mansionization. CD13 has been mostly spared the onslaught of mansionization, the tearing down of existing homes to build much larger ones on the same lot. Nonetheless, we need to protect the unique and historical character and scale of our district's neighborhoods. Last week, the Los Angeles City Planning Commission unveiled a 14-point policy agenda to set the city on a course towards sustainability, using Planning Director Gail Goldberg's mantra of "DO REAL PLANNING" as an acronym for the platform. I am looking at each of these planning principles through the lens of my work in my own district and the potential for citywide direction along these lines. While commercial signage has been a strong element in business districts throughout the country, the city continues to struggle to address the proliferation of illegal and unpermitted signs and supergraphics. In my district, I am working to secure funds to staff a permanent enforcement team that can focus on sign enforcement in the downtown Hollywood area, where for every illegal sign we get taken down, there seem to be two or three more popping up. I am also looking at legislation to increase fines for violating these laws and closing loopholes that allow "temporary" signs to be put up in a semi-permanent manner. Note: the blog's not reliably kept the Flickr credit on these posts, where I've used public photos. I've recently used shots by birdw0rks (of a green roof), Atwater Village Newbie (of the fire), and [fq9] (of the green-built Audubon Center at Debs Park. Recently, the Los Angeles City Planning Commission unveiled a 14-point policy agenda to set the city on a course towards sustainability, using Planning Director Gail Goldberg's mantra-DO REAL PLANNING as an acronym for the platform. On this blog, I am using this blog to share my thoughts on each of these planning principles through the lens of my own district work and the potential for citywide direction along these lines. During my first term in office, I successfully advocated for revisions in the city's landscape ordinance to encourage greening and water conservation and championed the expansion of the native tree protection ordinance. Private development can play a critical role in the greening of our city as well. We need to give specific incentives to buildings that incorporate more abundant landscaping. I am also working closely with my colleague Councilmember Ed Reyes to promote more green roofs atop our buildings. We hosted a green roofs symposium recently towards this end. Lastly, buildings that have vibrant and responsible landscaping receive points toward LEED certification and priority plan checks with the Planning Department. The city has long provided the option of listening to city council and committee meetings over the phone or watching on Channel 35. Now, you can stream the council meetings on-line live or archived within the last 24 hours. Our new technology employs a number of features including publishing, indexing, search, and closed captioning. Keeping government open, accessible, and accountable is a vital part of our democracy. This access will give Angelenos an even greater chance to observe and particiapte in issues that affect their lives. Here's a sample, from last month's Pioneer Women awards -- look for Jenny Lewis at the 1:04 mark. Or start using the service on your own. Join me along with Councilmember LaBonge, Councilmember Greuel, the Department of Transportation and the LA County Bicycle Coalition as we kick off Bike to Work Week with Metro on Monday, May 14. People will bike in from all over to City Hall, where from 11:30 to 1:00 there will be a bike rally, complete with live music, a custom bike show, and bicycle and health information from local organizations. Be a part of the solution for a better LA and pledge to bike to work and improve the environment by reducing traffic and pollution. 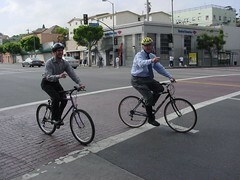 Stop by any one of the numerous Metro sponsored Bike to Work Day pit stop locations in Los Angeles County (including the one at the CD13 Field Office at Hollywood and Western) on Thursday, May 17 from 7:00am to 10:00am and show your support. You can calculate the pounds of carbon dioxide you’ll be saving by using the Carbon Calculator at the new CD13 Congestion/Pollution Reduction portion of our website. Last night at John Marshall High School, I met with families who had been evacuated and helped them get situated. The evacuation center was very well organized. When I arrived, there were about thirty-five people there, although it could have easily run at capacity (200). Some had brought pets: dogs and cats, some fish in plastic bags and, reportedly, a chicken. I ran into my friend Chad, who lives in Los Feliz; he wasn't sure if he was going to stay or not. Shortly after midnight, I went with Tom LaBonge up to the Griffith Observatory. Tom's passion for Los Angeles in general and for Griffith Park in particular is well known--he tended Dante's View for decades, long before holding office. I've marveled to hear the depth of his knowledge of the park as he communicates to reporters exactly where the fire has been and what damage he's done. We spoke to firefighters who were exhausted after 12-hour shifts, slumped at picnic tables a few dozen feet from still-visible flames. Councilmember LaBonge isn't alone in his love for Griffith Park, but I think he represents for many Angelenos the deep and emotional connection that we feel towards spaces. This morning, shortly before touring the back roads of the park, I spoke to a woman who had walked up from the neighborhood to the south. "This was my park," she said, through tears. Tom and I started from Vista del Valle and wove through the devastated moonscape. We saw logs still smoldering and pockets of green that had been successfully protected. 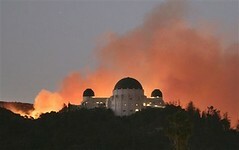 Griffith Park is not lost, of course, but it is damaged. We'll rebuild it, where we can, and it will grow back lush and green. It's the single largest urban park in the country; few other parks compare to it in its size and wildness. For now, we take our hats off to the emergency responders, from Los Angeles and from our neighboring cities under mutual-aid pacts, who are continuing to successfully protect life and property. We wish them speedy containment of this fire. Originally uploaded by [ fq9 ]. Recently, the Los Angeles City Planning Commission unveiled a 14-point policy agenda to set the city on a course towards sustainability, using Planning Director Gail Goldberg's mantra-DO REAL PLANNING as an acronym for the platform. Each day, on this blog, I am using this blog to share my thoughts on each of these planning principles through the lens of my own district work and the potential for citywide direction along these lines. Buildings consume 36% of total energy use in the United States, account for 30% of greenhouse gas emissions, 30% of raw materials yes, and 12% of water consumption across the country. 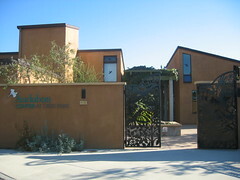 Building green is for more than just a few eco-friendly home owners scattered throughout the country. It is an integral part of sustainable living in an urban environment. Last year, I authored the legislation that gives priority plan check handling to any buildings that meet the Leadership in Energy and Environmental Design (LEED) Silver certification standard for green building. A few years earlier, I wrote the nation's largest statute requiring all city buildings to be built to LEED standards. Now, my staff is working with the Planning Department to craft a sustainability baseline for building in Los Angeles, along with an incentive program for buildings that employ higher sustainability measures. I have encouraged several builders to pursue LEED certification and I am hopeful that the first LEED Platinum commercial building in Los Angeles will be completed in my district. Last Sunday's Steve Lopez article chronicling Delilah's Bakery's journey through the city bureaucracy, nicely illustrating point #4 of the DO REAL PLANNING agenda. Delilah's story is familiar to many small businesses in Los Angeles. With the assistance of our Echo Park Field Deputy, Kabira Stokes, Delilah's was able to navigate through the various requirements and begin serving their delicious red velvet cupcakes. It should not take the individual case management of a council office for entrepreneurs to get through this system - the constituent-oriented service that Kabira provided for Delilah's should be standard operations for city departments. DO REAL PLANNING helps to get us to a point where every business feels like they get "small-town help in a big city." In the aftermath of the confrontation at MacArthur Park last week, I have formed a Special Task Force that will rigorously and honestly investigate the events of the May 1 protest. Chaired by Councilmembers Jack Weiss (chair of the Public Safety Committee) and Councilmember Ed Reyes (whose district includes MacArthur Park), the Task Force will expedite the investigation and provide a public forum to relay these findings to our residents. Swift action, open investigation, and holding responsible parties accountable will help restore the trust that has been breached. What happened in MacArthur Park on May 1 was heartbreaking, embarrassing to our city, and simply wrong, and the Task Force can help Angelenos know why it happened and ensure that it never happens again. Following the confrontation in MacArthur Park earlier this week, a number of hotlines were established to provide counseling and collect information from witnesses. Crisis counseling is available though the Los Angeles County Dept. of Mental Health ACCESS Call Center at (800) 854-7771. Bilingual staff are available 24/7 to address concerns and make appropriate referrals as needed. Witnesses with information from the MacArthur Park confrontation between protestors and polices may come forward with their accounts to the civilian-overseen Inspector General's office. The Coalition for Humane Immgrant Rights of Los Angeles (CHIRLA), a non-profit organization unafilliated with the city government, has also opened a hotline that Angelenos can call with eyewitness accounts. Last week, the Los Angeles City Planning Commission unveiled a 14-point policy agenda to set the city on a course towards sustainability, using Planning Director Gail Goldberg's mantra--DO REAL PLANNING--as an acronym for the platform. Each day, on this blog, I am sharing my thoughts on each of these planning principles through the lens of my own district work and the potential for citywide direction along these lines. One of the reasons that Los Angeles spends more time in traffic than any other American city is because we stopped locating jobs near housing, and vice-versa. Many communities that have seen significant job growth have not witnessed a similar rise in housing. One of the best ways to reduce traffic is to build mixed-use communities, where people can live, work, and play in a localized area. I have strongly supported the mixed-use boulevard designation for transit corridors in my district and introduced legislation allowing mixed use projects that incorporate retail, commercial, and residential spaces in regional centers like Hollywood. The development at Hollywood and Vine is a great example of this mix, with housing for residents of all income levels located near jobs atop a subway stop. Imagine how much less traffic we would have if we could all walk or use public transit to get to work near where we live, shop, eat, and play. The Los Angeles City Planning Commission has unveiled a 14-point policy agenda to set the city on a course towards sustainability, using Planning Director Gail Goldberg's mantra of DO REAL PLANNING as an acronym for the platform. Each day, on this blog, I am sharing my thoughts on each of these planning principles through the lens of my own district work and the potential for citywide direction along these lines. The 13th Council District is home to people at all income levels, and I am deeply committed to catalyzing housing production for all the diverse communities in the district. My office has consistently gone to bat for new, well-designed residential development. At the same time, developers seeking zone changes in Hollywood have volunteered affordable housing units as public benefits for the working families that live in our city. To achieve more homeownership opportunities for our residents, I have encouraged the use of the Small Lot Subdivision Ordinance, and several projects in my district are beginning to demonstrate that for-sale housing can be built more affordably. I continue to work with the Mayor and my colleagues to ensure that the Affordable Housing Trust Fund is fully funded. With housing prices in the urban core continuing to rise or maintaining their unaffordable heights, the expansion of affordable rental housing and homeownership will require efforts from all neighborhoods across Los Angeles to house our city. Under the charter, when the Mayor leaves the state of California, I become Acting Mayor. Following the confrontation in MacArthur Park last night, I spoke to Mayor Villaraigosa in San Salvador and released this statement to the media. I have remained in contact with the Mayor's office and with the Chief of Police. I would like to acknowledge those who participated peacefully in today's protests for their civic spirit, their commitment to freedom of expression, and their dedication to finding a humane political solution to addressing one of our nation's most complex issues. Hundreds of city personnel ensured that the city would keep running, including traffic officers who rerouted cars, public works employees who helped keep our infrastructure humming, and police officers who maintained public safety. Towards late afternoon, a confrontation near MacArthur Park between police officers and protestors disrupted the overwhelmingly peaceful tenor of today's protests. I have spoken at length to Mayor Villaraigosa about the confrontation, and I assure all residents of Los Angeles that the leadership of this city will thoroughly review all available accounts of the conflict and will do everything possible to see that appropriate and thorough investigations are undertaken as more information about tonight's events becomes available. Update: Along with the Chief of Police, the President of the Police Commission, and Councilmembers Reyes, Weiss, Huizar and Perry, I addressed the media about this issue today. My remarks are available here. Last week, the Los Angeles City Planning Commission unveiled a 14-point policy agenda to set the city on a course towards sustainability, using Planning Director Gail Goldberg's mantra of DO REAL PLANNING as an acronym for the platform. Each day, on this blog, I am sharing my thoughts on each of these planning principles through the lens of my own district work and the potential for citywide direction along these lines. Since I was elected in 2001, I have met with homeowners, developers, and community members frustrated by how long it takes to navigate through the city's red tape on projects that have already been approved by the community and the city. Good developments hesitate to come to Los Angeles because developers fear how long it might take to win approvals and commence construction in our city. As a member of the City Council Budget and Finance Committee, I pushed for additional staffing, located in the Planning Department and in other development-related departments, to help expedite community planning requests and to expedite projects. We've won many new hires, but we must do more. Gail Goldberg's strategic plan promises to reorganize and reinvigorate the Planning Department. I will do everything in my power to ensure that the department gets all the resources it needs in this years budget, and subsequent budgets, to reform the city’s development process and increase housing and commercial production.